The heart and soul of Rainier Valley can be summed up by the mural on the Darigold plant just outside of Columbia City. The mural displays a spectrum of diversity, with people of all colors and ethnicities and cultures. Above them all is Chief Seattle — the man who let the pioneers into his homeland and made the diversity of Rainier Valley possible. Rainier Valley’s zip code, 98118, has been called the most diverse in the nation. It’s a rumor-turned-fact-turned-rumor-again that, unfortunately, just isn’t true. But even if it is inaccurate, the area is certainly deserving of the title. According to the 2010 U.S. Census, no one race can claim majority in 98118. Asians comprise the biggest slice of pie at 32.6 percent (14,000 people), whites come in second at 30.9 percent (13,100 people), black people and African Americans come in at third place with 25.9 percent (11,000 people), and Hispanics fourth at 8.1 percent (4,450 people). The 2000 Census reports that more than 59 languages are spoken in the area, but the only evidence you need is a stroll down the street, or through Seward Park, where a cacophony of languages swirl through the air. More recent language data is unavailable. It’s quite a mix, especially for a city where white people remain dominant. (Just look at Ballard.) 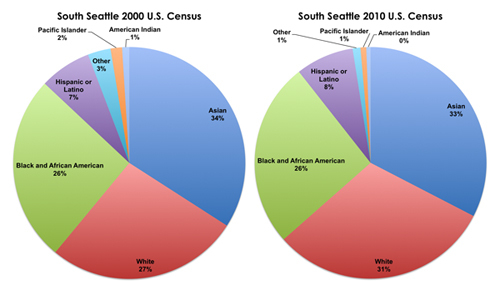 In the 2010 U.S. Census for the city of Seattle, 70 percent of respondents were white. In an attempt to quantify the actual diversity, HistoryLink commissioned a study using the Gini-Simpson Index. It’s a mathematical formula that calculates the likelihood that any two people chosen at random in a given geographical area will be of different races or ethnicities. According to the report, 98118 was the third most diverse in Washington state, after 98178 (the zip code directly south of 98118, between the Rainier Valley and Renton) and 98188 (SeaTac and Tukwila). Out of 17,000 metropolitan areas nationwide, 98118 comes in at a respectable but much less-hyped 64th. Of course, diversity is not something easily quantifiable. It’s hard enough to define in words. So trying to turn it into a measurement should be taken with a grain of salt. Still, Rainier Valley is considered to be a gateway for immigration. According to HistoryLink, immigration into the valley started as early as the early 1900s, when the Italians came and found a good market for their produce, turning Rainier Valley into the “Garlic Gulch.” By 1910, 3,454 people of Italian heritage live in Seattle, mostly in Rainier Valley. World War II brought demographic changes. The Japanese population dropped, but more moved from the International District to Southeast Seattle. African Americans moved to Seattle for defense jobs, many confined by discriminatory housing practices in the Central District, but some finding homes in a government housing project in Rainier Valley’s Holly Park area. Jewish families moved from the Central Area to the Seward Park neighborhood. By 1970, African Americans accounted for 14 percent of Rainier Valley’s population and Asians 17 percent. Several Samoans came to the area, mostly living in Brighton and Columbia City, after families were transferred to Tacoma’s Fort Lewis. According to local writer John Hoole, the white population decreased during this time by 20 percent. The passage of the Immigration and Nationality Act of 1965 and the end of the Vietnam War in 1975 brought an influx of Filipinos, Vietnamese, and other Southeast Asian populations. More recently, East Africans, including Ethiopians, Eritreans and Somalis, have immigrated to the area. The East African Community Services estimates that nearly 30,000 East Africans are now living in King County. Over the past decade, the Rainier Valley has seen signs of gentrification. At the center of it is Columbia City, now home to unique cafes and shops, a BeatWalk, a movie theater, a farmers market, and more. Between the 2000 and 2010 U.S. Census, over 2,000 white people moved to Rainier Valley, while other populations remained stagnant or saw little growth. According to a report released in 2012 by Puget Sound Sage, a labor advocacy group, the new trend doesn’t line up with its context. Over the same 10-year period in King County, the minority population grew by 47 percent while the white population shrank by 2 percent. In Rainier Valley, the minority population increased by just 5 percent, while the white population increased by 17 percent. Real estate offers more evidence for the case of gentrification. According to Zillow.com, in 2000, the average home value rested at $185,600, compared to Seattle’s average of $245,900. 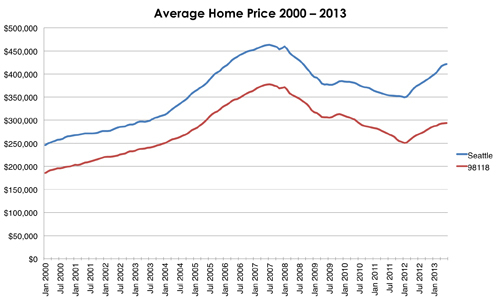 Home values in Rainier Valley reached a peak in pre-recession 2007 at $377,600. Since their recession dip, they have been on the steady rise again, reaching nearly $300,000 as of June 2013. In addition to its reputation as a gateway for immigrants, the Rainier Valley has a reputation for increased crime. However, that trend is slowly changing. Roughly 6.5 percent of the Seattle population resides in the Rainier Valley. 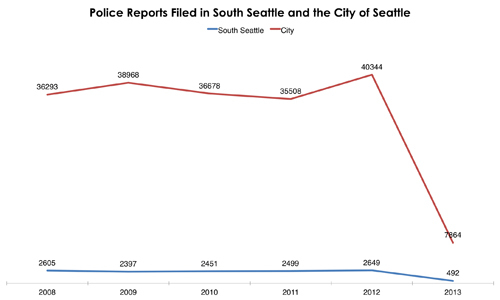 While in 2011, over 7 percent of police reports were made in the neighborhood, that percentage has been decreasing. In 2012, 6.5 percent of reports were made in Rainier Valley, and in 2013 to date 6.2 of the city’s reports have been in the Rainier Valley. Though the valley’s higher ethnic population may have reduced reporting rates, the decreasing trend is encouraging.